[I can’t get work] because I don’t have an easily definable look; I mean I don’t fall into a type like some chimpanzees. I’m not always silly and I’m not always brooding, I have a full palette of emotions. You’d think people would be looking for someone with that kind of depth, of complexity, but nooo, not on television. Rightly so, then, playwright Nick Jones has harbored this story in a theater, trusting that Boyer’s transformative powers will allow it to easily sail through the shifting tones just as Moritz von Stuelpnagel’s smooth-so-as-to-be-startling direction will anchor the ever-changing stakes of the show. The show, like the monkey, refuses to be what you expect: for instance, it features seductive dream sequences between Trevor and his former “co-star” Morgan Fairchild (Geneva Carr) and an amiable (and imaginary) rivalry between Trevor and a classier, white tuxedo-wearing simian named Oliver (Nathaniel Kent, another physical comedy powerhouse). Sandra’s actions are exaggerated for both dramatic and comic effect, depending on the sort of weapon you place in her hands. Trevor isn’t a comedy about a foul-mouthed monkey, it’s a drama about a foul-mouthed human trapped in the body of a chimpanzee. Ashley criticizes Sandra and Jim for humoring Trevor, for trying to understand him in human terms, and she’s absolutely right. But thanks to the nuances in Jones’s (surprisingly nuanced considering that feces is thrown) script, she’s also the villain for not trying to understand Trevor. She’s a sympathetic character, sure, but Trevor’s the one you’ll be empathizing with. That’s right. That’s you, sweetheart. That’s Trevor. Trevor? But I’m so…do I really…? It’s incredible, the way he recognizes himself. Smart, then, is the safest way to describe Trevor, both the chimpanzee and the play. 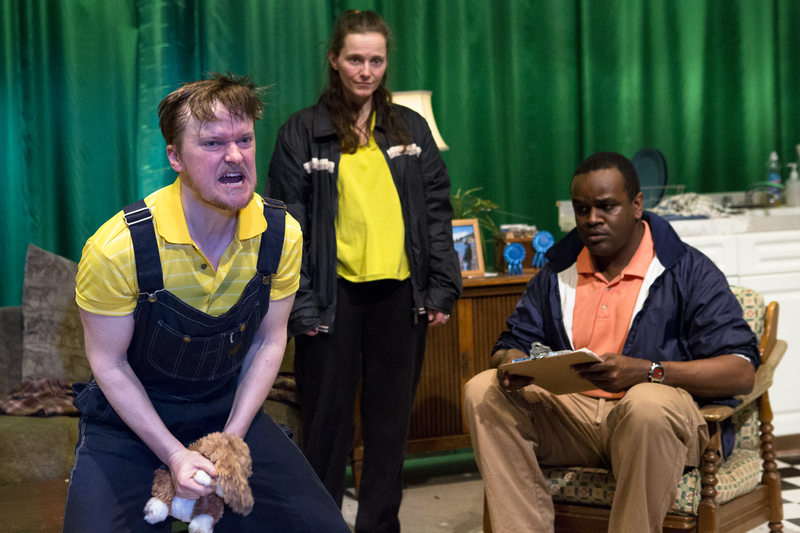 After all, calling something that makes you cry almost as much as you laugh “just” a comedy is about as accurate as calling an actor who wears a bunch of funny hats and sunglasses in front of a live audience “just” a chimpanzee.